Timber is a natural product so natural variations in grain, color, checking, are to be expected. Knots of various sizes are also to be expected. Checking is cracking that develops along the radius of a log. It rarely extends through the beam to the other side, and is accounted for in engineering calculations when sizing timbers. Usually it is not a structural problem. FOHC (free of heart center) timber typically has less checking than boxed heart timber. 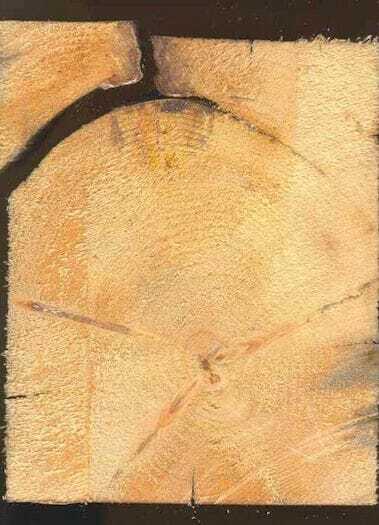 The heart is the center of the bulls-eye on a log before it is squared up into a timber beam. Shake is a timber defect. 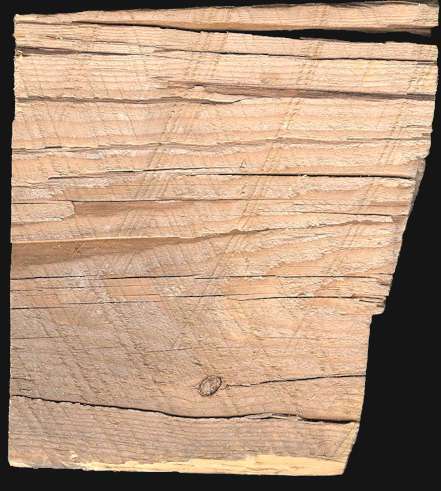 It occurs around the growth rings of a timber and is often found in older trees that grow in wet areas. Hemlock and Cyprus are particularly prone to shake. It may or may not be a structural problem depending on its depth. Usually it is just an aesthetic issue, like onion skin peeling away. We look for shake in the beams when we cut them, and discard any shaky beams that we are worried about structurally or that look bad. Unfortunately, shake sometimes can show up a year after the beam starts drying out and be completely invisible in the shop as we are cutting. Wane is a corner that is missing from the beam. It is actually the round edge of the log that is seen when the log is smaller than the beam. As long as the timber is graded properly, it is not a structural issue. Most of our timber has what is known as “pencil wane” which is 1/2 an inch or less. Sometimes native material, like pine, oak or hemlock will have much larger wane. The structural grading rules allow for 1/3 of the face of a beam to be wane, which is very rare. Great resources for lumber grading and design values can be found at the Northeast Lumber Manufacturers Association, WWPA Western Lumber Grading Rules, and Hall and Foreman Inc, Engineers. 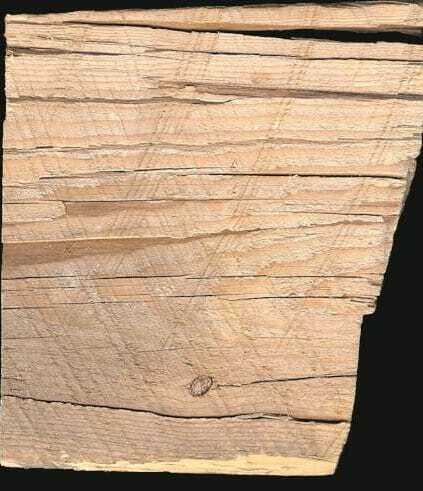 Shake is the separation of the rings in a piece of wood that occurs as it dries. The wood can also 'peel' off around the rings, similar to the layers of an onion. This image shows natural checking that is to be expected in timber. 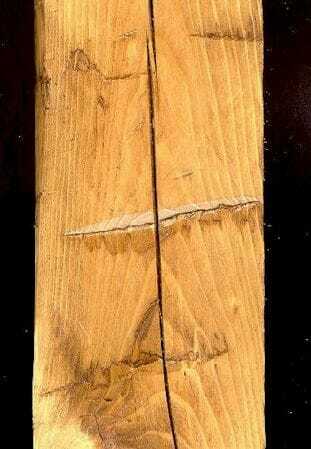 A "Check" is a long crack that appears as the sap wood of a timber shrinks around the heart wood over time. Checking is not a structural problem, and usually occurs only on one or two sides of a beam. Oak, however, can have surface checks everywhere, which many people feel add to the beautiful rustic appearance of a timber frame. Checking is the appearance of cracks or splits in wood as the wood dries out over time. 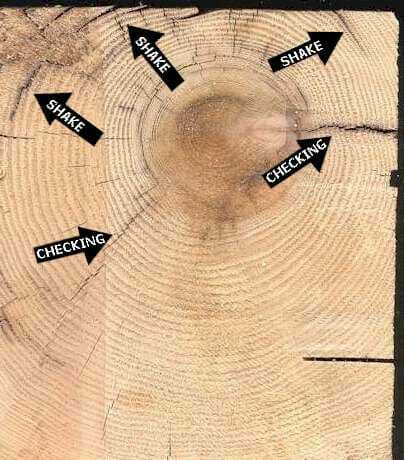 The image above shows extreme shake and checking in oak.